This enticing fashioned bracelet is a statement accessory. 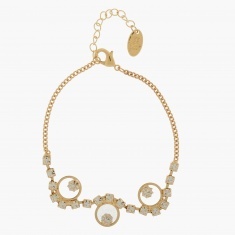 It comes in gilded finish and sports circle accents sprinkled with diamantine crystals. The lobster clasp fastener enhances wearing comfort.